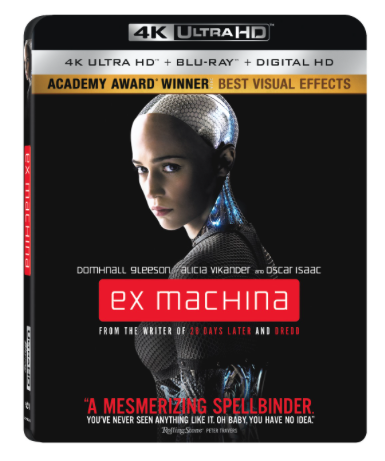 Lionsgate introduces, for the first time, ‘Ex Machina‘ on 4K Ultra HD Combo Pack and it’s coming to us June 6. See actors Alicia Vikander, Domhnall Gleeson and Oscar Isaac like never before in gorgeous 4K this summer. After winning a competition to spend a week at the mountain estate of his company’s brilliant CEO (Isaac), programmer Caleb (Gleeson) arrives to discover he has been chosen to take part in a study of artificial intelligence. Sworn to secrecy and cut off from the outside world, Caleb meets his subject, a beguiling and seductive android (Vikander) — and is plunged into an A.I. experiment beyond his wildest dreams in this epic thriller charged with heart-stopping suspense. This entry was posted on Monday, March 27th, 2017 at 3:31 pm	and is filed under Film, News. You can follow any responses to this entry through the RSS 2.0 feed. You can skip to the end and leave a response. Pinging is currently not allowed. « New Book Based on Filmmaker Jean Rollin Coming This Summer!! !